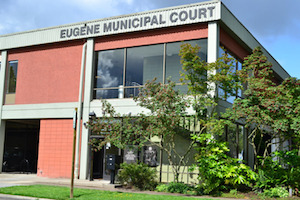 Eugene is a city in Lane County, and is the second most populous city in the state of Oregon with over 150,000 residents. Eugene has been featured on many “Best Of” lists including Forbes’ 2016 Best Places for Business and Careers and Livibility.com’s 2016 Top 100 Best Places to Live. Eugene’s appearances on these lists coupled with mild weather helps the community to attract new residents who enjoy year-round outdoor activities. The city is also known for its diversified housing opportunities, employment opportunities, and relatively low cost of living. 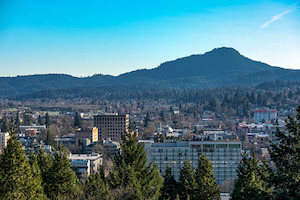 Eugene’s official slogan is “A Great City for the Arts and Outdoors” but is also referred to as the “Emerald City” for its abundance of natural beauty. 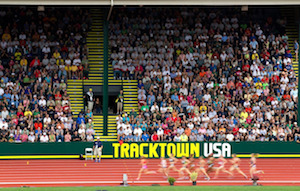 Another common Eugene nickname is “Track Town, USA” thanks to hosting several professional Track and Field events. The area is also credited for developing modern jogging and refining the contemporary running shoe. The Eugene, OR metro area, however, has recently taken on the nickname “Silicon Shire” for being home to a booming technology sector. There are more than 400 tech-based companies in that region that employ more than 4,500 people. Other big influences on Eugene include it’s “college town” culture, growing number of annual festivals, and progressive “green community” movements. There are 8 annual events and celebrations, for instance, that revolve around visual and performing arts, recognition of other cultures and environmentally friendly groups. The city is also host to 8 museums, 20 art galleries and a thriving public library in the downtown area. As for the college community, Eugene is the proud home of the University of Oregon, where the Oregon Ducks football team attracts its own following and sub-culture. Last but certainly not least, Eugene is the birthplace of Nike. Nike’s multi-national organization that exists today was founded when the Former Olympian and University of Oregon Track Coach Bill Bowerman created a new running shoe, and recruited one of the University’s runners, Phil Knight, to refine and market it. Phil Knight’s influence on the area is vast, and his generosity has helped to create the largest library in Oregon. The University of Oregon’s Knight Library hosts collections totaling more than 3 million volumes a vast number of audio and video items. If you are facing a DUI and other related criminal charges in Eugene, the surrounding areas in Lane County or elsewhere in Oregon, call Reynolds Defense Firm. You will need a competent DUI attorney who will fight on your behalf to get favorable legal results. While it is legal to represent yourself, going to court without a DUI lawyer is a mistake because there is a staggering difference between good intentions and good representation by an attorney who has strong rapport with members of the Eugene Municipal Court. Does that mean we can get under-the-table deals for you? No, but to be straight forward, having good relationships is a huge part of the criminal justice system. The legal system in Eugene is complex, consequences are too devastating to leave to chance, and a conviction will undoubtedly have a great impact on your future. Such consequences include destroyed relationships with loved ones, barriers to employment and income opportunities, fines, jailtime, and various other problems. Our team will not only provide you with all the services you need, we will help keep you accountable. Above all, we are a talented group and make great strides in representing and protecting the good people who need our services. Reynolds Defense firm has a team of DUI attorneys who have over 5 decades of combined experience, so when you show up to court with a lawyer from our firm, it shows you are taking matters seriously and are determined to get your life back on track. Hire us, or hire someone else, just make sure you move forward with an impeccable attorney who specializes in DUI cases, has solid relationships with members of the Court, and understands the criminal justice system in Eugene and the surrounding areas in Lane County. To take advantage of a free consultation, please contact us promptly in a way that makes you feel comfortable. You can always call Reynolds Defense Firm at (503) 223-3422 24 hours per day. You can also choose to chat or text us with our 24/7 live chat service, or contact us by submitting an online form. Our DUI lawyers believe in helping good people, are good at what they do, and will go above and beyond to figure out the next best steps for you and your loved ones.